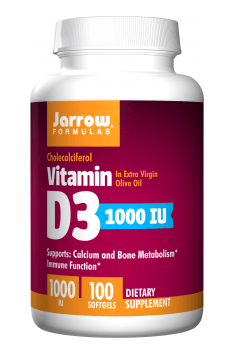 Jarrow Formulas Vitamin D3 is a dietary supplement containing 1000IU of vitamin D3 in the form of cholecalciferol in one capsule. Vitamin D3 – a substance of steroid structure, essential to maintain proper functions of the human organism. It is sometimes called a “sunny vitamin”, as it is produced by means of skin synthesis under the influence of the activity of sun rays. Its characteristic is distinguishable from other vitamins, as it demonstrates hormonal effect by activating specific VDR receptors, located in almost all cells building humans. Against the common belief that it is only important for the proper development of bones and prevention of rickets in children, it is currently believed that it positively influences the functioning of the whole organism, including even regulation of blood pressure and sensitivity of cells to insulin. Vitamin D is produced from cholesterol and more precisely from 7-dehydrocholesterol. The synthesis takes place on the surface of skin when it is exposed to the activity of UV-B sun rays, which are emitted around midday, between 11 a.m. and 2 p.m. After transforming cholesterol into cholecalciferol, it is transported to the liver, where it is further converted to calcidiol (12(OH)D3), i.e. the form which is most often tested in blood tests. However, its metabolism is not stopped here yet, as to its full activity, the transformation to the active for is necessary, i.e. calcitriol (1,25(OH)D3), which is produced mainly in the kidneys. Statistics carried out by scientists around the World show, how important the deficits of this vitamin may be, as the majority of the societies do not have the proper level of this vitamin in blood. Surprisingly, is also concerns the countries with high insolation all year round. There are a few causes of this phenomenon. The most serious of them is insufficient exposition to sun in the hours conducive to the production of vitamin D, as an average human being spends this time at work or school and even if outside, clothes inhibit the access of UV rays to skin. We also cannot ignore frequent improper eating habits and a diet low in nutrients, which does not provide proper levels of vitamin D with food. As widely known, in order to maintain high endurance of bones and teeth we need calcium. However, this matter is so complicated that we should not focus only on the proper amount of calcium in food. It is incredibly vital what happens with calcium after introducing it into the system, i.e. the level of its absorption and its distribution in the organism. One of the main factors enabling the regulation of the level of calcium in blood and its proper utilization is vitamin D.
Many of us are worried about the state of health we will have in the future and especially at elderly age. However, apart from mere thinking, it is worth taking care about proper prophylaxis right now and it is decidedly worth implementing vitamin D3. As scientific studies show, higher levels of vitamin D decrease general mortality in patients, regardless of the cause, which is a very promising result. Looking closer at the particular ailments, we may notice the reduction of developing cancer of i.a. intestines, breasts, prostate or pancreas and developing cancer is an especially unattractive vision of the future. However, even when you are already sick, you may count on the support from the side of vitamin D, as it may reduce the symptoms in such diseases as lupus, multiple sclerosis or asthma. The correlation between the low level of vitamin D and the occurrence of depression disorders is well-documented. Researchers also prove that complementing this level to the desired values results in the general improvement of the patient’s state. There are also certain premises to think that high level of vitamin D influences better sleep quality, which is one of the key factors to maintain well-being. Vitamin D is also an important factor protecting the nervous system from damages caused by, for example, toxic effect of glutamate. Excessively strong activity of this neurotransmitter, especially towards NMDA receptors, causes neuron excitotoxicity, i.e. nervous cell death caused by excessive stimulation and excessively high inflow of calcium ions to their interiors. Thanks to this, we may potentially protect ourselves from various forms of dementia, including Alzheimer’s and Parkinson’s diseases. Jarrow Formulas Vitamin D3 is recommended as prophylactic vitamin D supplementation both for adults and children. It is effective support for general health and especially for the functioning of the musculoskeletal system, nervous and immune systems. It is especially recommended to supplement vitamin D in the fall-winter season, as because of the thicker layers of clothes, we expose smaller skin surface to the activity of sun and limit natural production of vitamin D.
For adults, take 1 softgel per day with a meal or as directed by your qualified healthcare professional. Because of the fact that this vitamin is soluble in fat, it is recommended to take it with a meal containing fatty products for more efficient assimilability. It seems especially beneficial to take the supplement in the fall-winter season, because of the weaker natural production and the possibility of lowering the frequency of colds, however, there are no contraindications to use a prophylactic dose all year round. For prophylactic purposes, it is best to use a daily dose of 1000-2000IU, while in case of deeper deficits and health problems that may result from vitamin D deficits, the recommended dose is 4000 IU and more. Since vitamin D is accumulated in the organism, there is a possibility of taking appropriately high dose once a week. Extra virgin olive oil. Softgel consists of gelatin, glycerin, and water. Live cultures of Lactobacillus sporogenes, supporting the balance of intestinal microflora. Combines horse chestnut extract with the other renowned extracts. Supports for leg vein circulation. Unique herbal blend for healthy liver function and normal detoxification processes. Powdered, medicinal mushrooms Chaga. Strengthens the immune system and improves overall health.